Press SET to enter the setting menu. Use SELECT to choose 1-6. Press SET to enter. Press UP/DOWN to change the current (blinking) digit. Press SELECT to jump to next digit. Press SET to confirm and quit. I like it as well. Was going to consider a clock of his, but I think there is a mistake. 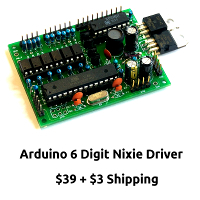 I just don't see $800 for a 4 digit clock, and just under 300 for a single digit clock. maybe typos in his auction? Great insights! I will share this to my friends in facebook.